This edition features a linked Table of Contents and Footnotes. Objects of the Expedition — Personal Interest shown by Naval Authorities — Members of the Zambesi Expedition. Arrival at the Zambesi — Rebel Warfare — Wild Animals — Shupanga — Hippopotamus Hunters — The Makololo — Crocodiles. Kebrabasa Rapids — Tette — African fever — Exploration of the Shiré — Discovery of Lake Shirwa. The Steamer in difficulties — Elephant hunting — Arrival at Chibisa’s — Search for Lake Nyassa — The Manganja country — Weavers and smelters — Lake Pamalombé. The Upper Shiré — Discovery of Lake Nyassa — Distressing exploration — Return to Zambesi — Unpleasant visitors — Start for Sekeletu’s Country in the interior. Magnificent scenery — Method of marching — Hippopotamus killed — Lions and buffalo — Sequasha the ivory-trader. Illness — The Honey-guide — Abundance of game — The Baenda pezi — The Batoka. The Victoria Falls of the Zambesi — Marvellous grandeur of the Cataracts — The Makololo’s town — The Chief Sekeletu. Life amongst the Makololo — Return journey — Native hospitality — A canoe voyage on the Zambesi. The waterbuck — Disaster in Kebrabasa rapids — The “Ma Robert” founders — Arrival of the “Pioneer” and Bishop Mackenzie’s party — Portuguese slave-trade — Interference and liberation. The Lake tribes — The Mazitu — Quantities of elephants — Distressing journey — Detention on the Shiré. Arrival of H.M.S. “Gorgon” — Dr. Livingstone’s new steamer and Mrs. Livingstone — Death of Mrs. Livingstone — Voyage to Johanna and the Rovuma — An attack upon the “Pioneer’s” boats. Return to the Zambesi — Bishop Mackenzie’s grave — Frightful scenes with crocodiles — Death of Mr. Thornton — African poisons — Recall of the Expedition. Dr. Livingstone’s further explorations — Effects of slave-trade — Kirk’s range — Ajawa migration — Native fishermen — Arab slave-crossing — Splendid highlands. Important geographical discoveries in the Wabisa countries — Cruelty of the slave-trade — The Mazitu — Serious illness of Dr. Livingstone — Return to the ship. Confidence of natives — Bishop Tozer — Withdrawal of the Mission party — The English leave — Hazardous voyage to Mosambique — Dr. Livingstone’s voyage to Bombay — Return to England. 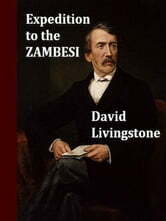 "David Livingstone (1813 – 1873) was a Scottish Congregationalist pioneer medical missionary with the London Missionary Society and an explorer in Africa. His meeting with H. M. Stanley on 10 November 1871 gave rise to the popular quotation "Dr. Livingstone, I presume?"